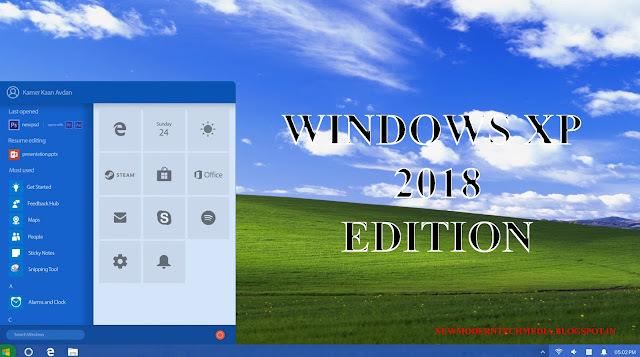 Windows XP 2018 Edition is the operating system Have you thinked about this.? Despite Microsoft ending support for Windows XP back in 2014, it’s still in use around the world. The latest usage figures from NetMarketShare give the vintage OS a decent 6.13 percent share of the market, and it’s still to be found in many businesses. The OS first appeared 17 years ago and the final service pack (SP3) came out a decade ago. Compared to Windows 10, XP now looks incredibly dated, and lacks many of the modern features we take for granted. But what if Microsoft updated it? YouTuber Kamer Kaan Avdan, who has previously created concept videos for Windows 11, iOS 12 and Android 9.0, has the answer with a new video showcasing his vision of Windows XP 2018 Edition. The video gives XP a Fluent Design makeover with transparency effects and curved corners, while cleverly keeping the operating system’s original color scheme. The Start menu blends XP’s design with that of Windows 10, including live tiles, and it looks fantastic. The inclusion of Timeline is an inspired touch as well. The video also includes a few clips of XP’s original design so you can compare it with the re-imagined version. I’m not sure Rover, the cartoon search companion from XP who originally made his debut in Microsoft Bob, should be included in the update, but that’s about my only issue with this concept. Anyway, watch the video below and share your thoughts on it in the comments. Would you switch from Windows 10 to Windows XP 2018 Edition?